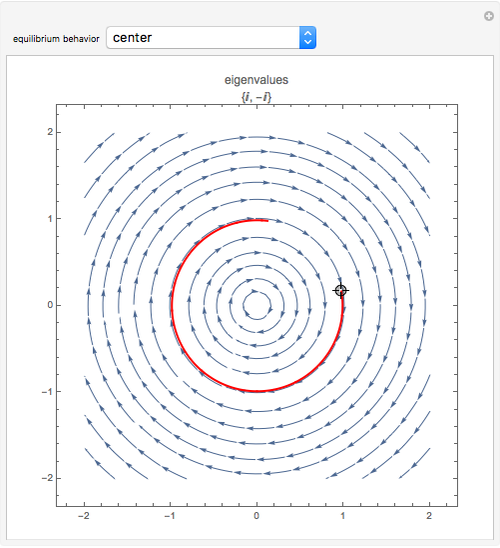 This Demonstration illustrates the behavior of equilibrium points for various two-dimensional systems of differential equations. 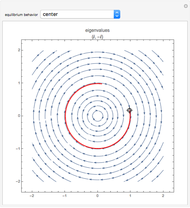 The solution curve for a specific initial condition is plotted in red over a stream plot of possible trajectories for the system. Choose the type of behavior from the drop down menu and drag the Locator to choose the initial condition. The eigenvalues of the linearization of the system are shown at the top. While this Demonstration does not offer an exhaustive list of all possible equilibrium point behaviors, it includes the most common and interesting of the two-dimensional cases. The saddle node, subcritical Andronov–Hopf, supercritical Andronov–Hopf, and Bogdanov–Takens systems give bifurcations, not simple equilibrium points. Bifurcations arise from the collision and subsequent interaction between two or more equilibrium points. For the case here, . This saddle node acts as a saddle on the right and as a sink to the left. The resulting equilibrium point has one zero eigenvalue and one negative eigenvalue. For the supercritical case, and . For the subcritical case, and . The subcritical Andronov–Hopf bifurcation is a spiral sink within the limit cycle, so the eigenvalues match those of a spiral sink. The supercritical Andronov–Hopf bifurcation is a spiral source within the limit cycle, so the eigenvalues match those of a spiral sink. For the zero solution, and . J. Guckenheimer and Y. A. Kuznetsov. 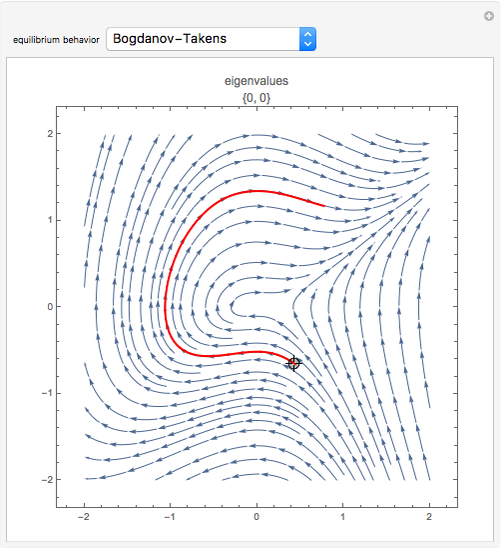 "Bogdanov–Takens Bifurcation." 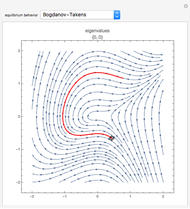 (Dec 5, 2014) www.scholarpedia.org/article/Bogdanov-Takens_bifurcation. E. M. Izhikevich. "Equilibrium." (Dec 5, 2014) www.scholarpedia.org/article/Equilibrium. Y. A. Kuznetsov. "Andronov–Hopf Bifurcation." (Dec 5, 2014) www.scholarpedia.org/article/Andronov-Hopf_bifurcation. Y. A. Kuznetsov. 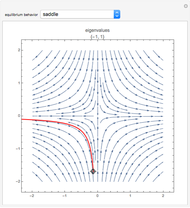 "Saddle-Node Bifurcation." 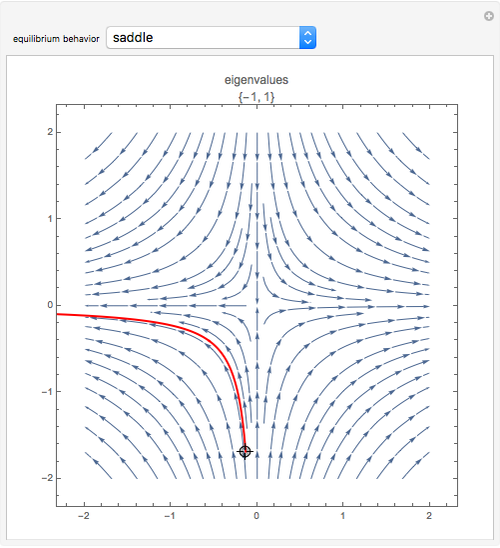 (Dec 5, 2014) www.scholarpedia.org/article/Saddle-node_bifurcation. Akshay Jaggi and Raymond Yuan "Behavior of Equilibrium Points in Two-Dimensional Systems of Differential Equations"